In a society where bigger is often deemed to be better, the thought of downsizing your property might not instantly grab you as something you want to do but downsizing does not always have to mean downgrading. Recent research by Saga shows that around 10% of people downsize their property in retirement in order to improve their quality of life and free up more money. Mr and Mrs Russell had both entered into retirement and wanted to spend more time doing the things they enjoyed such as golfing and cruises. They had no mortgage outstanding on their £300,000 property and were thinking of downsizing. “We had always enjoyed a good quality of life but now that I had stopped working we found we did not have as much money as we would have liked. We had always taken pride in our home and both of our now grown up children were brought up there,” says Mr Russell. “Our main concern about downsizing was that we would not be able to accommodate any visitors. We had two grandchildren and wanted to make sure there was enough room for them to come and stay if they needed to” explains Mr Russell. Their current property was detached and had four bedrooms. They discovered they didn’t really need all of those rooms. Ideally they wanted to free up around £100,000 so they were going to need to downsize to a property in the range of £200,000. “There were a few essentials that we wanted from our potential new home. We wanted at least two double-sized bedrooms and if possible another small one. We searched the market and found a three bedroom semi-detached property which was near to our family and not too far away from our old house,” explains Mrs Russell. “We knew that downsizing would mean a few changes. The smaller room was not as big as we had liked and we would not have as much space for storage, so we decided on embark on a throw away binge,” she adds. 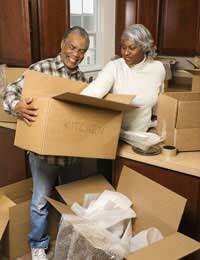 “One of the biggest annoyances of downsizing was the cost. The profit we made from downsizing was dented by the amount we had to pay in moving fees. After we had paid the solicitors fees, the lawyers and estate agent, our profit was only around £92,000, which was a shame,” says Mr Russell. “The cost was unavoidable but it is something to consider if you are relying on freeing up a set amount of money,” says Mr Russell. “The new house was fantastic, we were able to make use of the space we had and enjoyed inviting our family over to stay. We did miss our old house but we did enjoy spending the extra cash we had, it was definitely not a decision we regretted,” explains Mrs Russell. If you are looking to downsize in retirement you should be realistic about how much space you are likely to require. If you currently live in a house with a lot of bedrooms think realistically about whether you need that room or you would prefer to spend the money on something else. Downsizing out of necessity can be hard and that is when you will need to start bargain hunting and seeing what you can get for your money. Most people generally find in retirement that a smaller house can be very beneficial and not only frees up some cash but can also cut down on bills and cleaning.